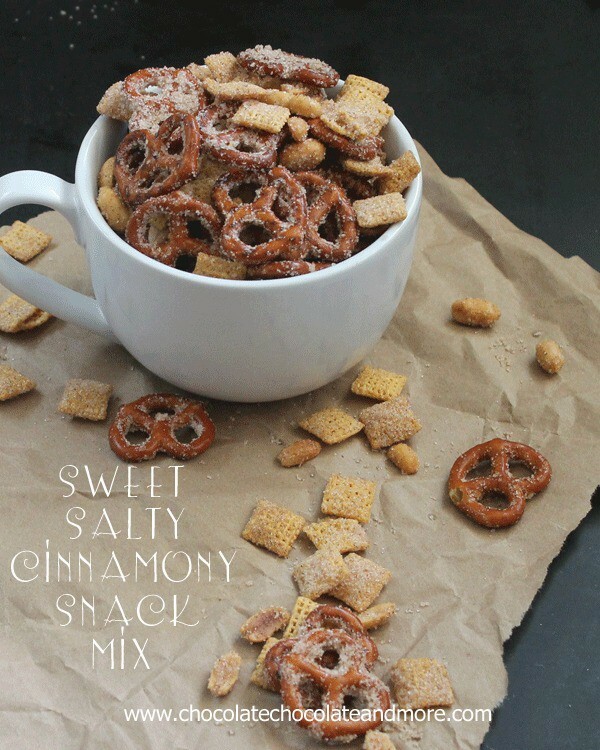 Sweet Salty Cinnamony Pretzel Snack Mix - Chocolate Chocolate and More! Sweet Salty Cinnamony Pretzel Snack Mix-you’ll want to clean out the snack cabinet and make this! What is it with snack foods, especially pretzels? You buy them for a party or maybe because you know they are healthier for you than say…Doritos. The bag gets opened and everyone nibbles on them for a few days. And then it happens. Everyone stops eating them, with only a serving or so left in the bag. This seems to happen every time, especially with pretzels. I know why, it’s all the jostling of the bag, knocking the salt off. No one wants to eat a naked pretzel, at least not in my house. Honestly, I think a few are just in it for the salt. You can’t just throw the bag away, that’s wasteful. So instead, you recycle. You find the last of the peanuts and the box of cereal tucked into the back corner. A little butter, sugar, cinnamon and more salt. You’ve got a whole new snack food and trust me, this one won’t end up half eaten, shoved in the back of the cabinet. I had to force my son to share some with the girls. Preheat oven to 325 degrees, line a baking sheet with foil. 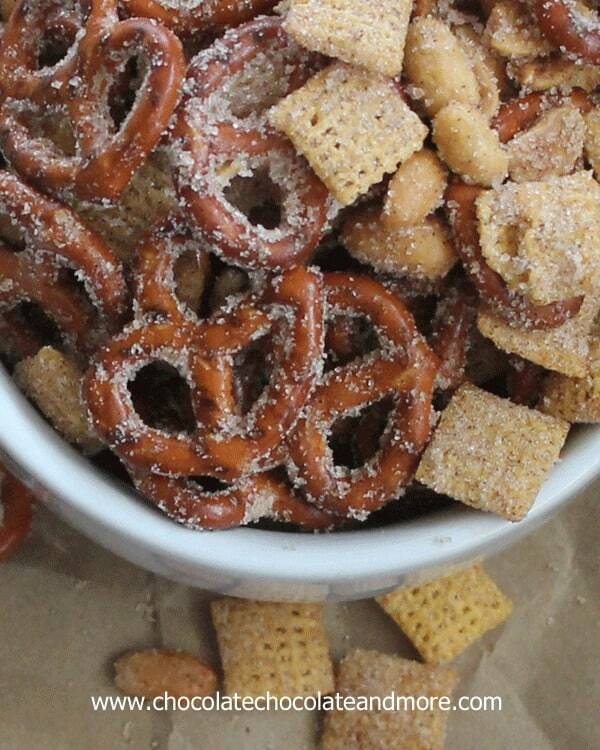 Put the cereal, pretzels and peanuts in a large bowl. Drizzle melted butter over the top and stir to coat. Combine sugar, cinnamon, salt in a large ziploc bag. Stir or toss to combine well. Add in pretzels, cereal and peanuts. Shake to coat. Spread mixture out on baking sheet. Bake for 7-8 minutes. Let cool completely before storing in airtight container. 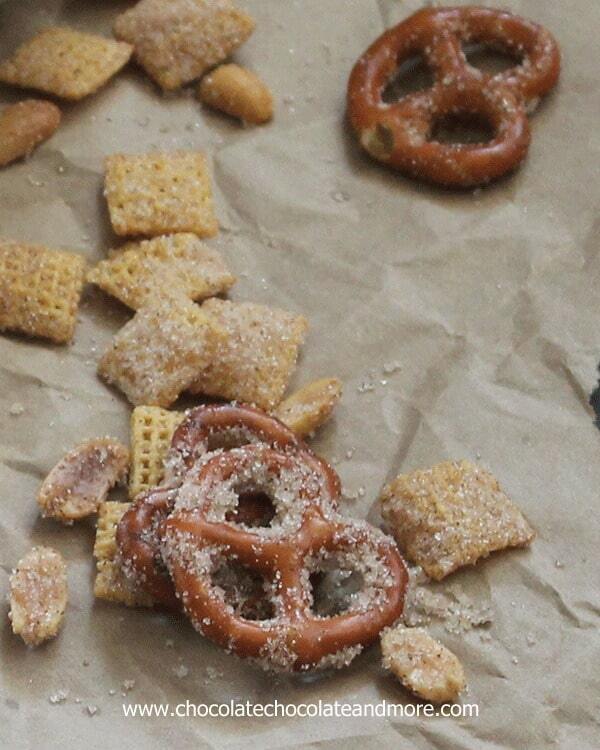 Salt at the bottom of the pretzel bag is a great salt substitute for this recipe. Oh man! This looks addicting. 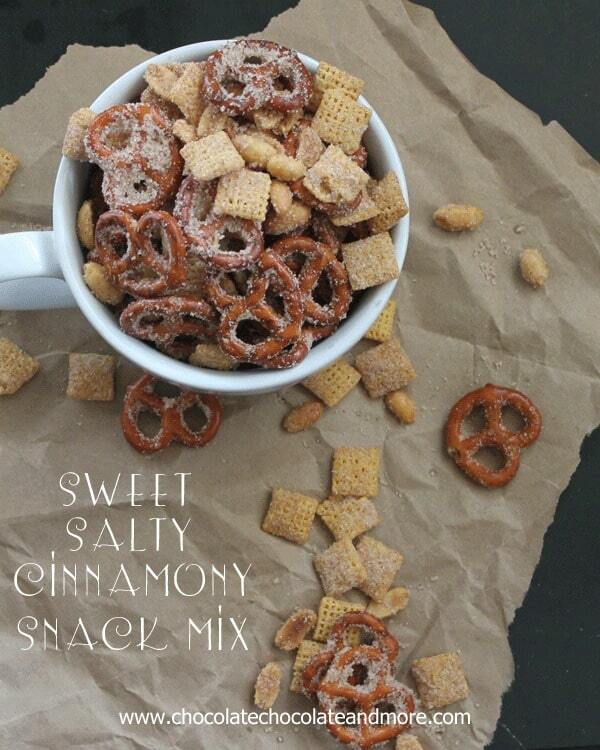 I am in love with salty/sweet snack mixes! Butter, sugar, cinnamon = perfect. Thanks for linking to my puppy chow, too! Oh my gosh you are so right! I hate finding bags of snacks or crackers or even cereal where there are only a handful at the bottom!!! I love this mix Joan, I an see eating this at the pool. Meaning ME eating this pool side while the family goes about ands swims! I love that end of the bag syndrome! We get it a lot in our house with cereal and yes, pretzels! 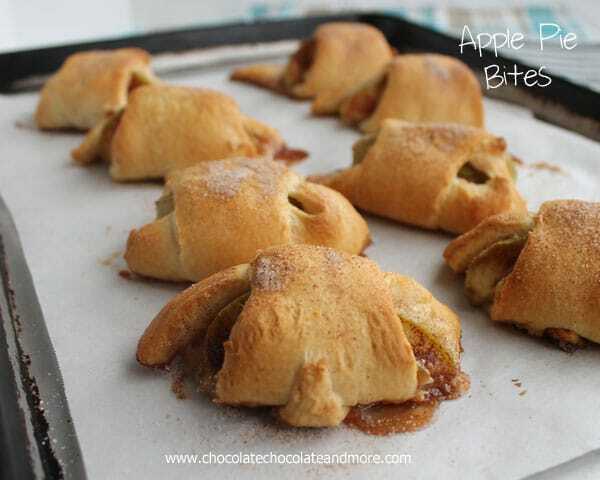 This sounds so yummy….pinned! Visiting from Weekend Wonders and following you on Pinterest! Thanks for the reminder that I need to make my own snack mix. I love munching on this stuff!! I tried this last weekend, and it did not go well. First of all, 3 tbsp is A LOT of cinnamon and very overpowering. 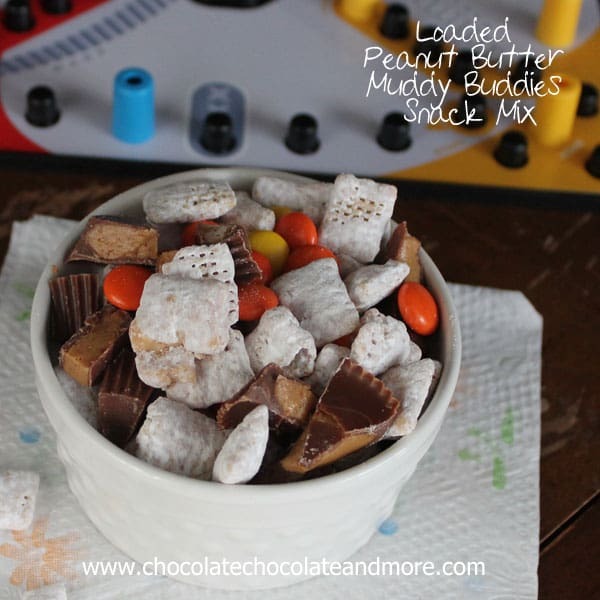 I tried it again with 3 tsp instead, but mixing everything together resulted in a very clumpy mix that did not stick well to the chex, peanuts, and pretzels. If I were to try it again, I would probably coat everything in butter and then add the cinnamon, sugar, salt mix. I had the same exact thing happen last night! Looked like clumps of brown in the bag, but I threw the pretzel mix in there anyway (to follow the instructions). Mine looked NOTHING like the pictures above. Her picture makes it look so sugary/salty, but when you add that much cinnamon, how could it not have any color? 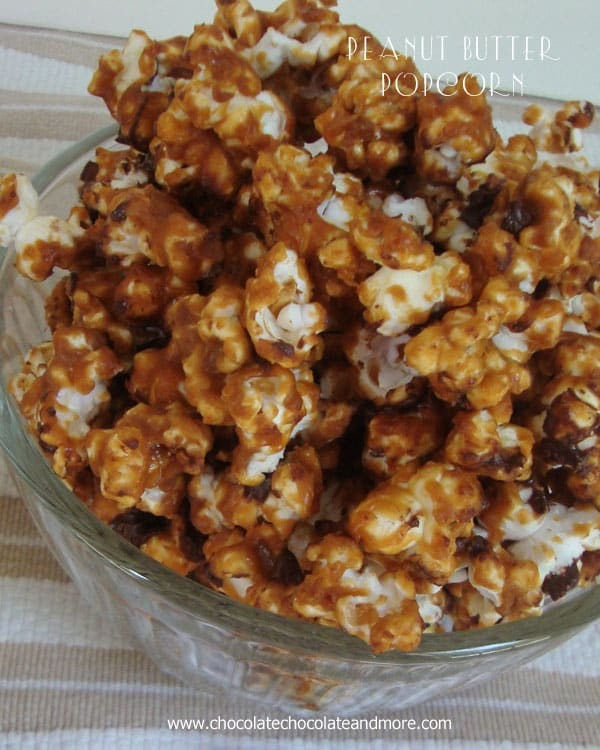 Same thing happened to me…everything clumped together into a brown gooey mess. I’m hoping once it cools it will look a little better. I made it as a gift for neighbors, and aunts/uncles but not sure I will pass it along or toss it. How was the taste when it was clumped? Anyone?? I just took this out of the oven and yum. After reading the reviews, here is what I did. I put the cereal, pretzels and peanuts in a large bowll, drizzled with melted butter and tossed to coat. 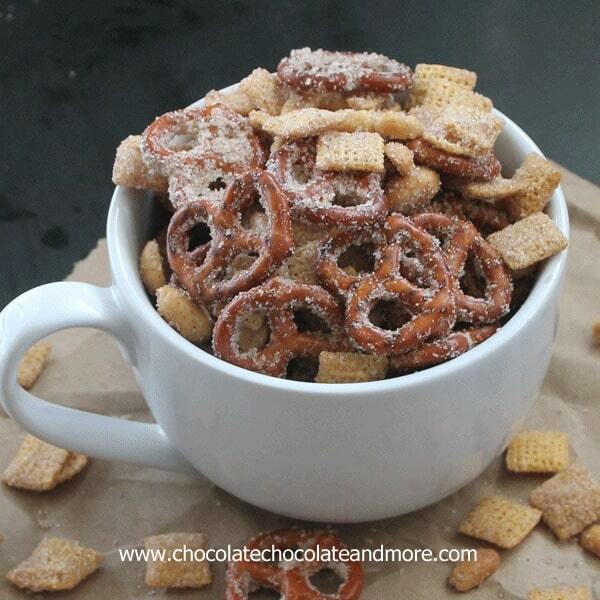 In a measuring cup I mixed the sugar, 1tablespoon of cinnamon and salt and tossed with cereal mixture and baked. It turned out great. 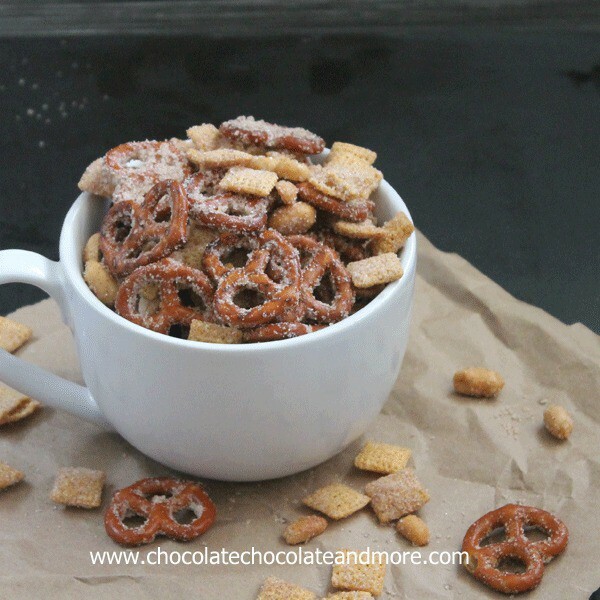 can Cheerios be a substitute for the chex? I always have that, but not chex..